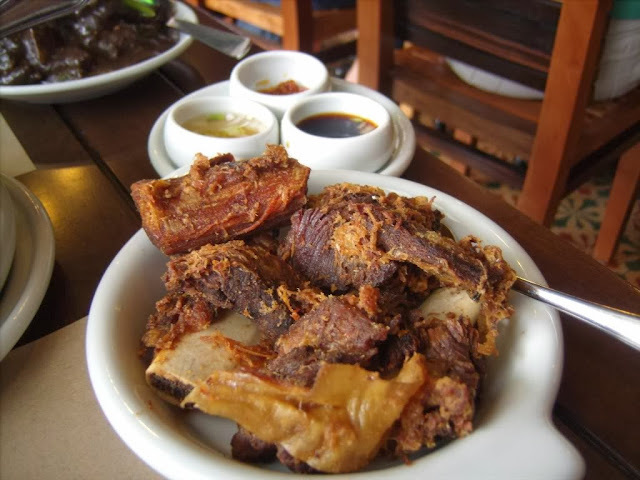 Crispy Tadyang ng Baka is beef ribs marinated with a sweet tangy mix and deep fried to crispiness. Definitely a mouthwatering dish for that gastronomic experience. It is a main dish popular "pulutan" usually served at Filipino specialty restaurants. It is made up of beef spareribs pre-boiled until tender, then deep fried and serve with vinegar chili dip. 1. Boil cubed beef ribs in water (enough to over the ribs in the pot), add soy sauce (you may add more to taste), brown sugar, star anise, bay leaf, peppercorns, white onion and salt to taste. 2. Remove the scum that floats on top as soon as the water boils. 3. Lower the heat and simmer the ribs until fork-tender and the bones are easily separated from the meat, around 2-3 hours. 4. Drain the ribs well. Let it cool. Reserve the boiling liquid and freeze this once it cools. It can be used for Chinese-style braised beef brisket. 5. Chill the ribs overnight. Before cooking, set out the ribs 30 minutes beforehand. Heat enough oil in a deep pot for frying. Deep-fry the ribs until crisp. Be sure to cover the pot as this will surely splatter. 6. Serve the ribs with a dip of soy sauce, vinegar, pepper and chopped onions with optional bird's-eye chili.